It is the radiant blue sky - a wash of paint of utter simplicity, which turns a slightly paler shade as it moves higher into the atmosphere - which is so ravishing in this painting. Beneath the canopy of that sky, the ornamental details of the architecture and the shadowed street below offer an intriguing, richly textured, contrast. This is a watercolour of great skill as well as of seduction. 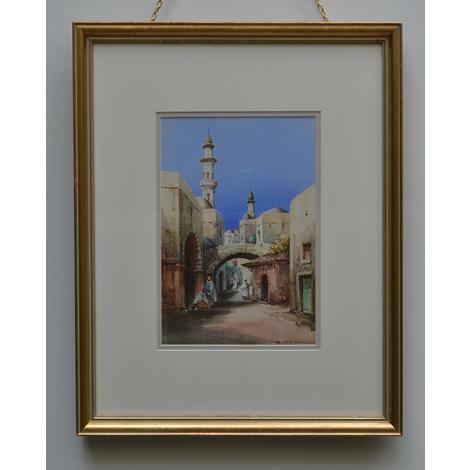 The bold simplicity of this painting owes something, surely, to David Roberts, the Scot who was one of the first independent, professional artists to visit the North Africa, in the 1830s, and whose work later reached a wide audience through numerous lithographs.